Egypt's army ousted and detained Islamist president Mohamed Morsi on Wednesday after a week of deadly clashes and mass protests calling for him to go after a year in office. His defence minister, armed forces chief General Abdel Fattah al-Sisi, announced Morsi's overthrow on state television, even as police began rounding up key Morsi aides and leaders of the Muslim Brotherhood. Warrants have been issued for the arrest of a total of 300 Brotherhood officials, state media reported. But at least seven of Morsi's supporters were killed in clashes with security forces in Alexandria and the eastern city of Marsa Matrouh, security officials said. Already this last week, at least 50 people have died in clashes between the Islamist's supporters and opponents in the days leading to his ouster. Morsi and his senior aides were placed "under house arrest" in a military facility, a senior Muslim Brotherhood member told AFP. The ousted president was later taken to the defence ministry, Gehad El-Haddad added. His father, Essam El-Haddad, a senior Morsi aide, is one of those detained. Morsi issued a defiant call for his supporters to defend his elected "legitimacy" in a prerecorded speech that appeared online after Sisi's statement. 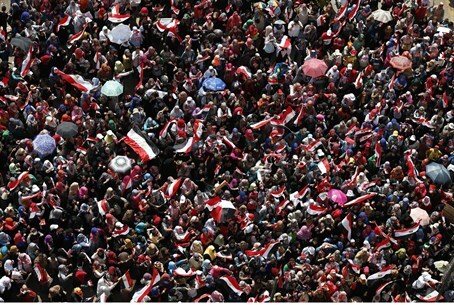 Thousands of his supporters remained camped out in northern Cairo, but Egyptian television stations stopped broadcasting live feeds of the pro-Morsi rally after the military announced his overthrow. US President Barak Obama said he was "deeply concerned" over Morsi's ouster and called on the army to refrain to "arbitrary arrests" of Morsi and his supporters. In May, Washington approved $1.3 billion in military aid to Egypt. That was now under review, said Obama, as he called for a swift return to democratic rule. Police also began arresting leaders of Morsi's Muslim Brotherhood movement, an interior ministry general told AFP. Saad al-Katatni, head of Morsi's Freedom and Justice Party was already in custody , he added. In an amateur video posted online, Morsi declared: "I am the elected president of Egypt" and urged people to "defend this legitimacy". Earlier, Morsi's national security adviser Essam al-Haddad, said on Facebook: "For the sake of Egypt and for historical accuracy, let's call what is happening by its real name: military coup." Already, the security forces had shut down broadcasts from a Muslim Brotherhood television channel, a Morsi aide told AFP. Staff of Al-Jazeera's Egyptian affiliate were also arrested after the channel aired a defiant speech by the deposed president, the station reported. Dozens of armoured personnel carriers headed towards Islamist gatherings around Cairo to head off trouble.